Copyright © 1992 by the Confederate Air Force and Jack Morgan. All rights reserved. Originally published in The Dispatch magazine, Volume 17, Number 1, Spring, 1992 edition. If you are interested in subscribing to The Dispatch please write to The Commemorative Air Force, ATTN: Dispatch Editor, PO Box 62000, Midland, TX 79711-2000 or call (432) 563-1000. Reproduced with permission. Stories of exceptional aircraft, like those of heroic persons, are usually more interesting if one knows their background and/or lineage. Planes, again like people, are extensions of their background and ancestry; they are what they are called upon to do, and they are because of what because of their evolution from earlier forms. and ushered out...World War II. and never looked back. The FF-1 was a biplane, as were all the naval fighters of the day, but it was the first retractable gear fighter to serve on a carrier  the USS Lexington, June 1933. 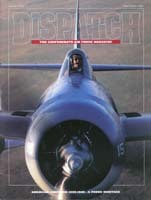 The FF-l was followed in early 1935 by the F2F, the Navy's first single-seat fighter to be built by Grumman. Though it was still a biplane, it featured what was then a powerful engine, the 650 h.p. Pratt & Whitney R-1535, and was considered to be one of the finest fighters around at the time. Close on the heels of the F2F came the F3F, still a biplane, but larger and more powerful with the Wright R-1820 engine. This model remained in operational service until just before World War II. and two sets of wings! A rival company, Brewster Aviation, came up with the Brewster XF2A "Buffalo"  a clean monoplane design with the powerful Wright R-1820 engine, and the Navy was impressed enough to put it in the running. Grumman engineers, also impressed, went back to the drawing boards and redesigned the XF4F- 1 into a mid-wing monoplane powered by the Pratt & Whitney R-1830-66 engine which boasted 1,050 h.p. still hopeful and still working to overcome their engine problems. Persistence did win out, finally, and in August, 1939, Grumman won a contract for a new design called the F4F-3, with production starting in February of the next year. Navy Fighting Squadron Four (VF-4), aboard the carrier USS Ranger became the first unit to fly what by now was being called the "Wildcat." An interesting variation of the Wildcat design was the F4F-7 model, which with its 130-gallon fuselage tank and 555 gallons of fuel in the wings, could actually fly for more than 24 hours. Designed for reconnaissance purposes, only 21 of these planes were built, and they saw only limited use. Actually (and curiously) even though the U.S. Navy had accepted a total of 345 Wildcats by the end of 1941, the first operational use of this model was by the British Royal Navy. To find out how and why, we have to go to France. The French Navy had ordered and were testing Wildcats fitted with a Wright R-1820 engine with a whopping 1,200 h.p. This was in the spring of 1940, when the German Army began to overrun the French borders. The British quickly stepped in and took over the rest of the French order. The planes were immediately put to use and renamed "Martlet Is" by the British military. They soon put in an order for 100 more and before it was all over, had in service a total of 1,100 Wildcats of all types. Back in the United States, the Navy was trying out an even newer design  the XF4F-4, which became the "folding wing" version of the Wildcat. They soon found that the added weight of the folding mechanism was heavy enough to degrade performance of the plane noticeably. Production models were redesigned by cutting out the hydraulic system and operating the folding and unfolding of the wings manually. These new Wildcats were then assigned to Fighting Squadron Three (VF-3) on the carrier USS Yorktown in June, 1942, shortly after the Battle of the Coral Sea. It should be mentioned here the importance of having folding wing aircraft on carriers by noting that the Yorktown was able to increase its complement of Wildcats from 18 to 27 with the advent of the F4F-4. By the following month, the USS Enterprise and USS Hornet also were equipped with the new Wildcat. In Britain, the Royal Navy, after their initial order, stipulated that subsequent orders should have folding wings and six .50-caliber machine guns rather than four. This was all well and good, but with six guns they could carry only 240 rounds per gun instead of the 450 rounds and this reduced firing time from 34 seconds to only 18 seconds. The newer models were fitted with a later model Pratt & Whitney engine and redesignated "Martlet IIs." without asking the opinion of American pilots, who were not all happy with this latest version. with the frisky Zero. The result was the F6F Hellcat. To free its facilities for the new plane production, Grumman transferred production of the Wildcat to the General Motors Eastern Division in New Jersey in June of 1943. All the Wildcats produced by GM were designated FM-1s or later, FM-2s. They differed from the Grumman version primarily in having four, instead of six, machine guns. With all the lessons being learned from combat, the Grumman engineers came up with the XF4F-8, using a higher powered Wright R-1820-56 engine of 1,350 h.p. and weighing about 530 pounds less than the F4F-4 and FM-1. Redesignated FM-2 at the GM plant, this "Wilder Wildcat" was produced right up to the end of World War II. Thus, the Wildcat, in its many versions, was in service at the very beginning of the war as the only really effective U.S. carrier fighter, continuing operations in almost every naval campaign in every operations area in World War II. At least three of its American pilots received Medals of Honor while flying the Wildcats. For many months, in and around the Pacific theater, it was the only naval aircraft to successfully combat the Japanese air armada. In spite of the fact that the Zero was considered vastly superior in most categories, the Wildcat managed to hold its own. he won't be too polite in his rebuttal!